Trojan-Ransom.Win32.Rector malware encrypts JPG, DOC, PDF and RAR files on a computer and demands ransom for decryption. 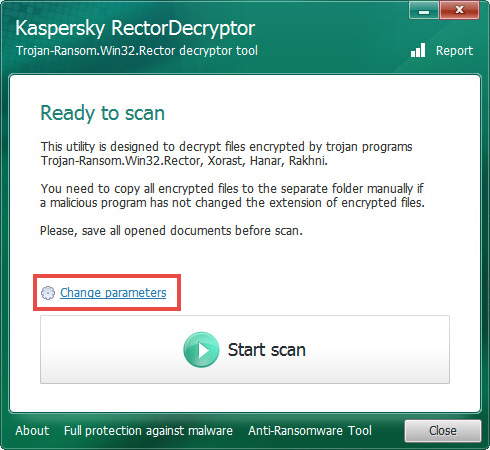 To decrypt the files encrypted by malware, use the Kaspersky RectorDecryptor tool. Download the Kaspersky RectorDecryptor tool. Run RectorDecryptor.exe on the infected computer. Carefully read the Kaspersky Lab End User License Agreement. Click Accept if you agree with all the points. 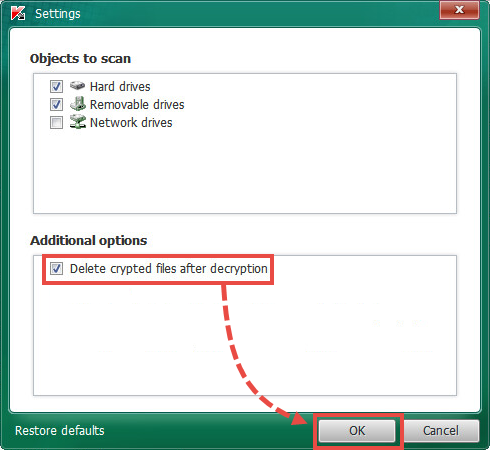 Select the checkbox Delete crypted files after decryption to delete the copies of the encrypted files with VSCRYPT, INFECTED, BLOC or KORREKTOR extensions. Copy the encrypted files to one folder (if folder extensions haven’t been changed by malware). Specify the path to the encrypted file or to the folder with encrypted files. The report will be created on a system drive (usually, disk C:\). The report is saved under the following name: RectorDecryptor.Tool_version_Date_Time_log.txt. If the tool didn’t help, submit a request to technical support through My Kaspersky with a detailed description of your issue. Ask a question in the Virus-related issues branch of the Kaspersky Lab forum.